A different type of fried. Being a true city, Chicago has plenty of late-night food. On one of my nights there, a buddy took me to The Vig in Old Town after a few beers because it supposedly has an amazing fried chicken sandwich. The trouble is that they don’t have the full menu at night and that limited menu does not include the aforementioned fried chicken sandwich. There was, however, live music to make up for it and a chicken parmesan sandwich that would attempt to quench my hunger for fried fowl. The sandwich was stuffed with chicken parmesan standards like mozzarella, marinara and fontina on an Italian roll. It was, well, exactly what a chicken parmesan sandwich should be. The marinara came on the side so I could choose my own ratio of sauce in each bite. 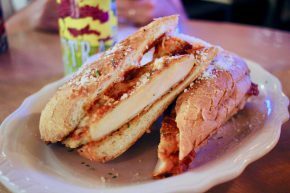 The chicken itself was tender and juicy, while the Italian roll was nicely toasted. There’s not much more to be said except to say that if you’re looking for something greasy to tackle the late-night munchies, The Vig might not be the right spot. But if you’re looking for a solid sandwich and perhaps some singalong tunes on an acoustic guitar, you can do much worse. Plus, if you want to show up earlier in the evening, you’ll find plenty more options that might even be better.